Attractive, laminated top table that can be fully adjusted to use over a bed or a chair. Adjustable Bed & Chair Table...Attractive, laminated top table that can be fully adjusted to use over a bed or a chair.The table is adjustable in height, width and angle to fit a wide range of users and furniture. 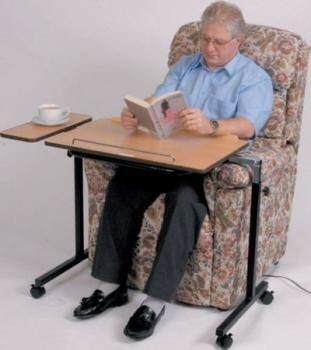 Comes with a reversible side table for right or left hand use. Fitted with four locking castors, adding stability and reassurance. An added feature to this table is the safety locking mechanism that avoids over extension. Overall table width 720 to 1220mm (284/5 to 484/5"). Height adjustable from 700 to 910mm (28 to 362/5").